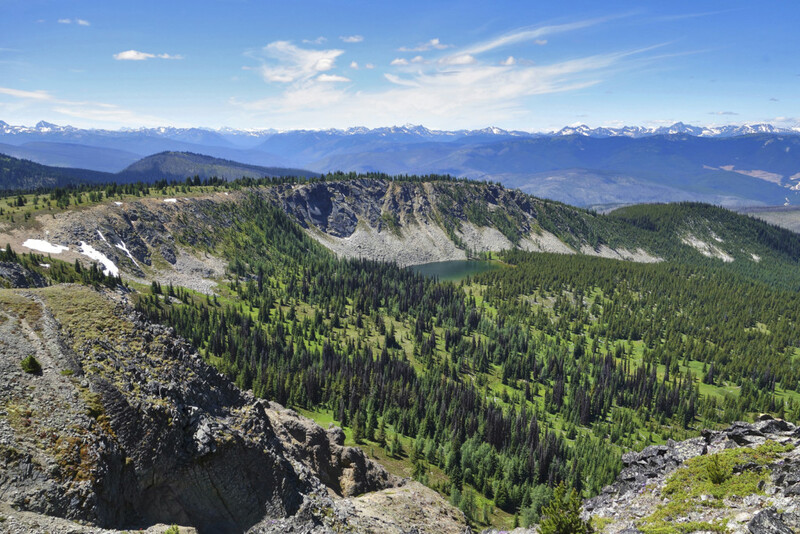 We’re new to the Eastgate area and haven’t spent much time east of Manning Park. A few of us decided to check out Flat Top Mountain during wildflower season. The trip was on our radar, and moved up in priority due to recent condition updates. There are a few ways to approach Flat Top mountain; we approached it from Placer Lake, which allowed quick access into the alpine. 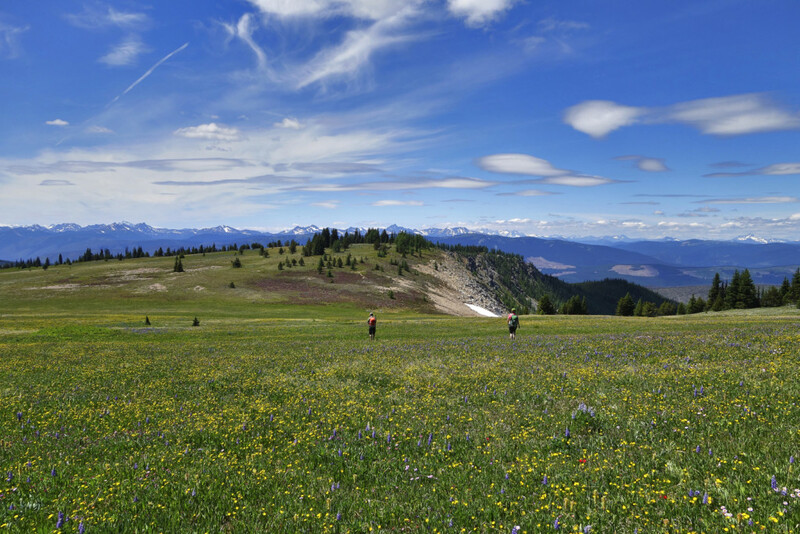 The meadows were stunning and from the (flat) top, we could scout a number of future trip objectives. Wildflower season was beautiful here, I’m interested in coming back during the fall & winter seasons for a contrast in colours and temperature. 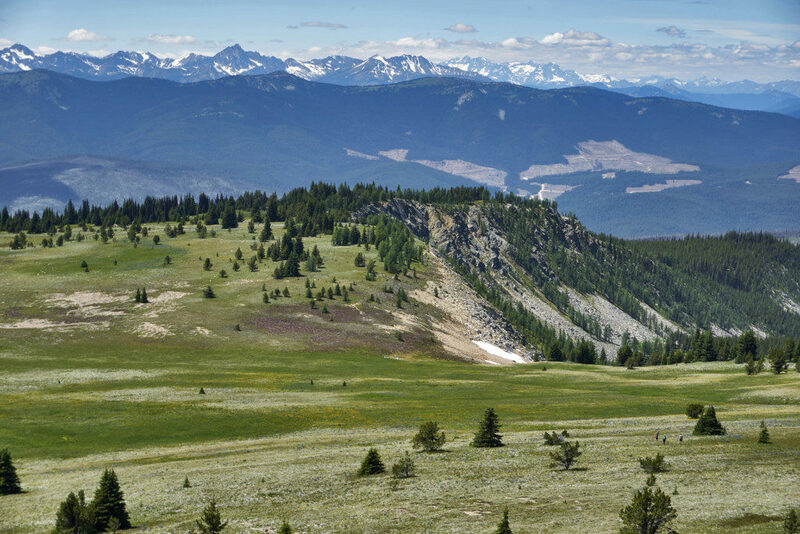 What the area lacks in big summits, it makes up for with rolling meadows and winding ridges, stretching out for days. 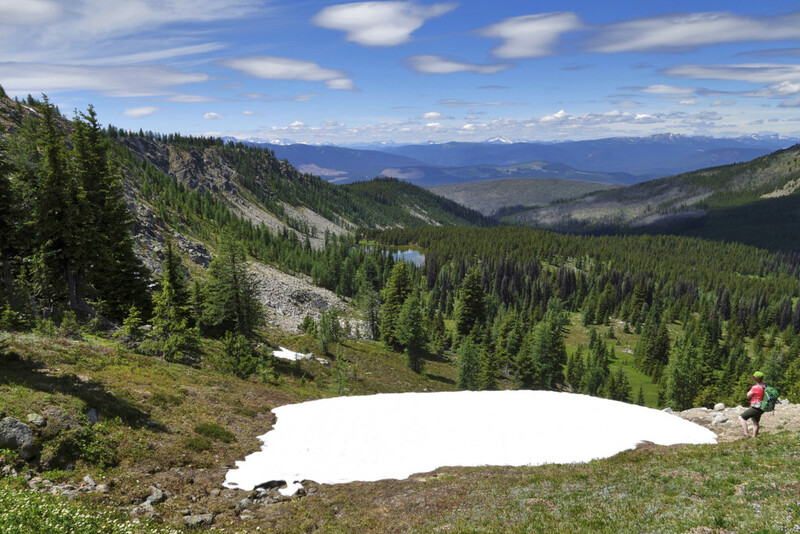 Area: Between Manning Park and Cathedral Park, Crowsnest Highway, BC. 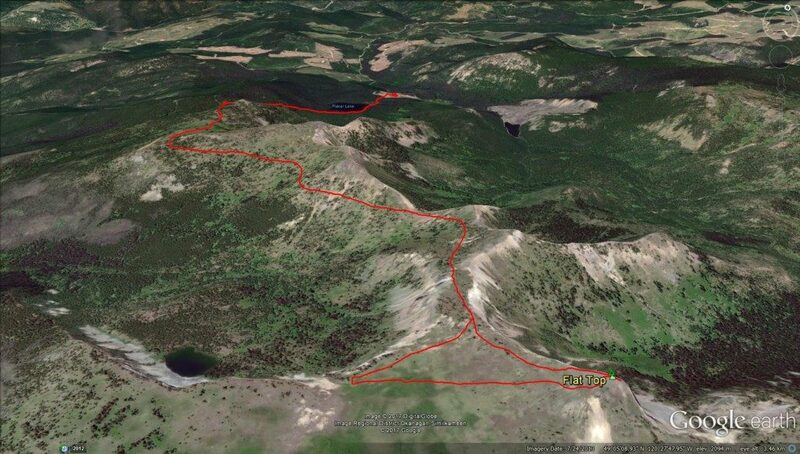 Objective: Flat Top Mountain via Placer Lake trail. 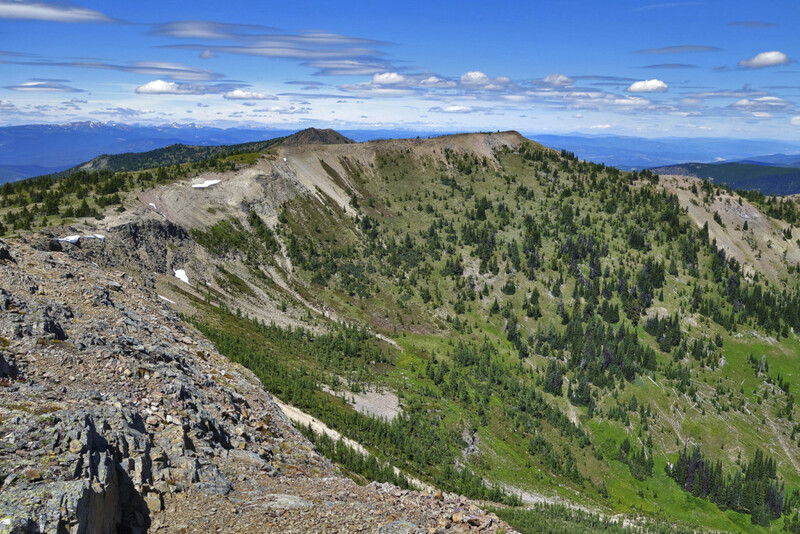 Nearby hikes: Three Brothers via Heather Trail, Nicomen Peak, Frosty Mountain (and here), Windy Joe. 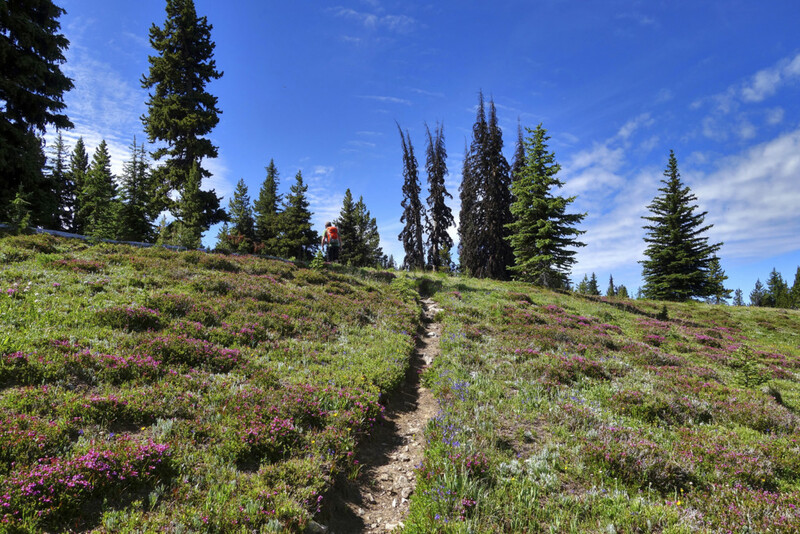 Good to know: The trail allows quick access to subalpine meadows above Placer Lake. 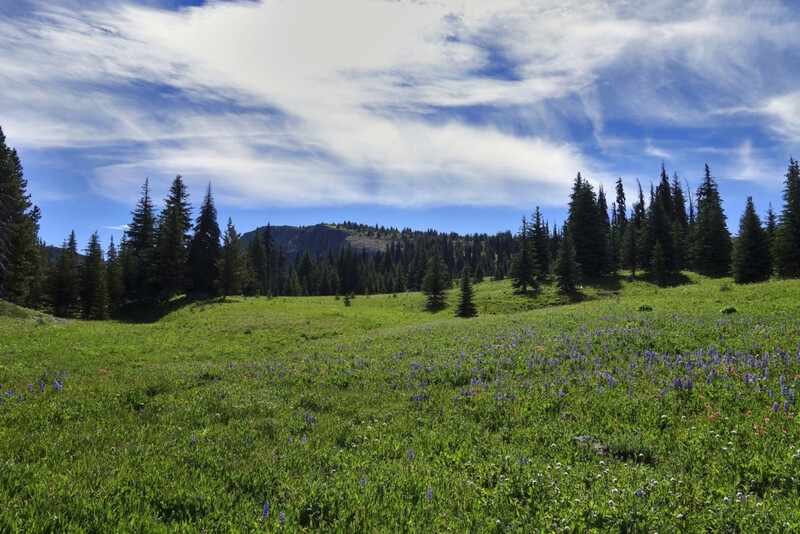 It offers stunning ridge-walking through wildflower meadows peaking in mid-late July. 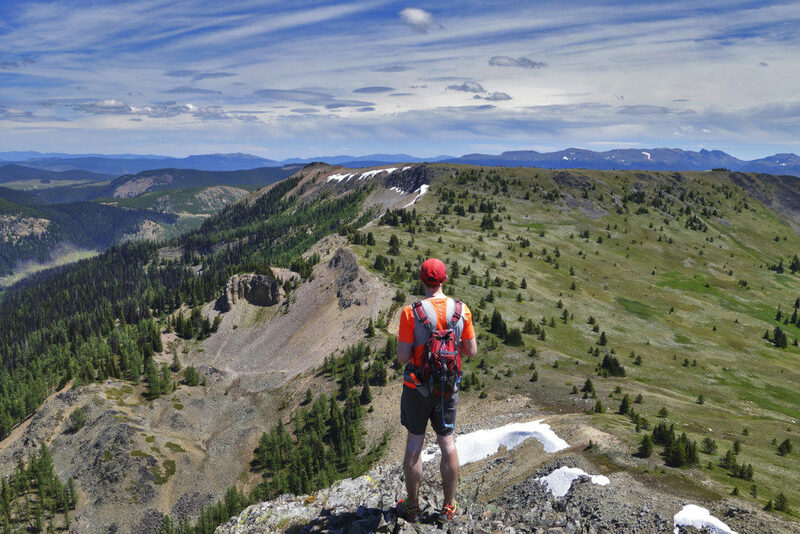 It’s part of the world renown Fat Dog 120 Ultra Trail Race. ✓ Head east on Highway 1, take the Highway 3 (Crowsnest) exit in Hope. 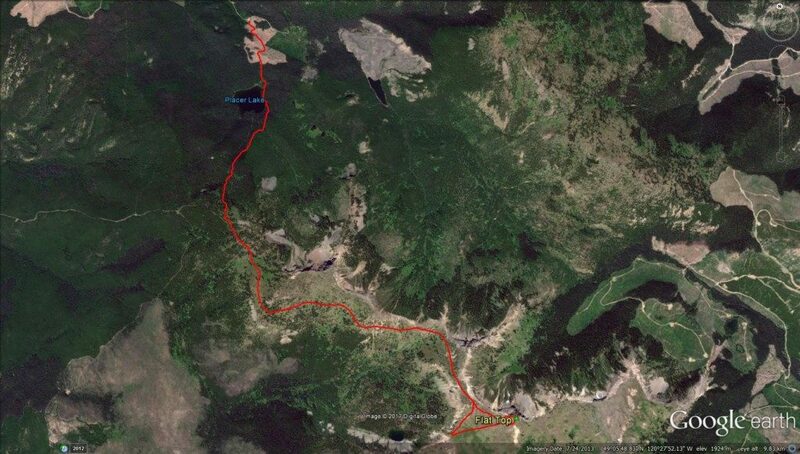 ✓ Continue east on the Crowsnest, past the Manning Park Resort, and past the Eastgate Esso. ✓ In 9km, turn right onto the Placer FSR (at the big right hand curve) and zero your odometer. ✓ Go over the bridge. Stay right at 1.5km and 9.5km. At 12km turn right onto Calcite Road. ✓ At 14km turn left onto Placer Bobcat Road. At 19km turn left (4wd is best from here). 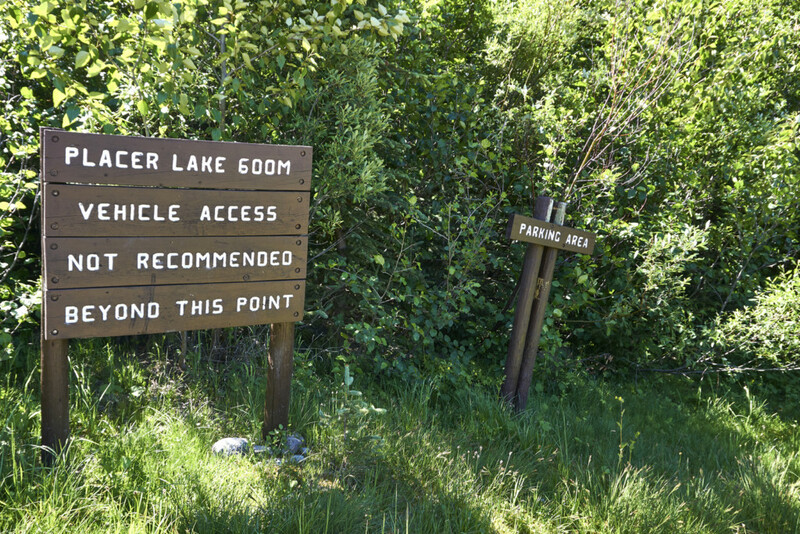 ✓ At 20.5km, you can park your vehicle near the sign for Placer Lake rec site. Note: A sign at 20.5km will warn against driving further. Those with 4wd high clearance vehicles and experience driving steep/loose sand and rock can drive the remaining 1.5km to the lake; we parked here and walked in. We parked in the lot and switch-backed up the rough road through an old cut block. At the top, the road leveled out and meandered through the trees to the Placer Lake Rec Site. 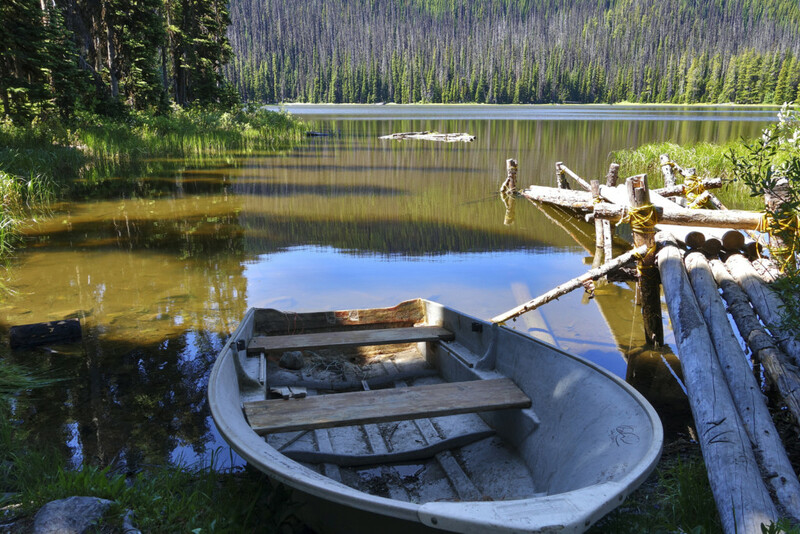 This is a beautiful spot, with 3 campsites, and an outhouse on the shore of the lake. 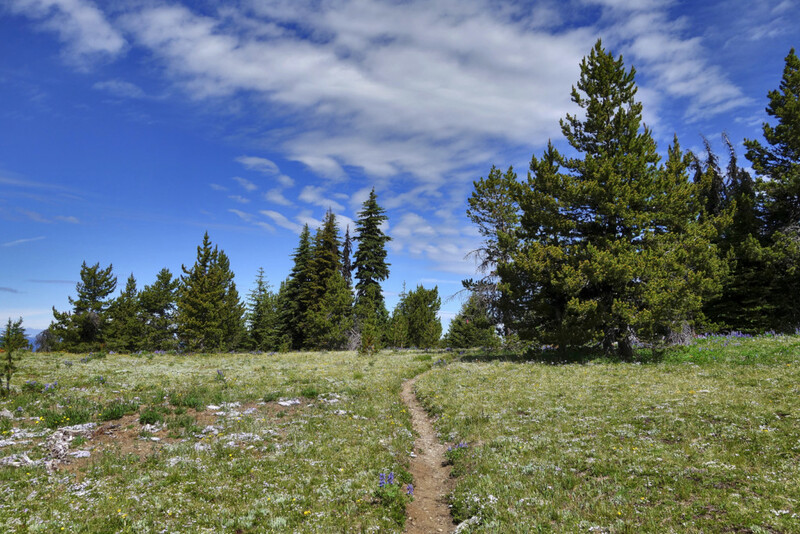 We continued along the east side of the lake, crossed a small inlet stream, and picked up the Placer Lake Trail, just beyond the campsite on the NW corner of the lake. 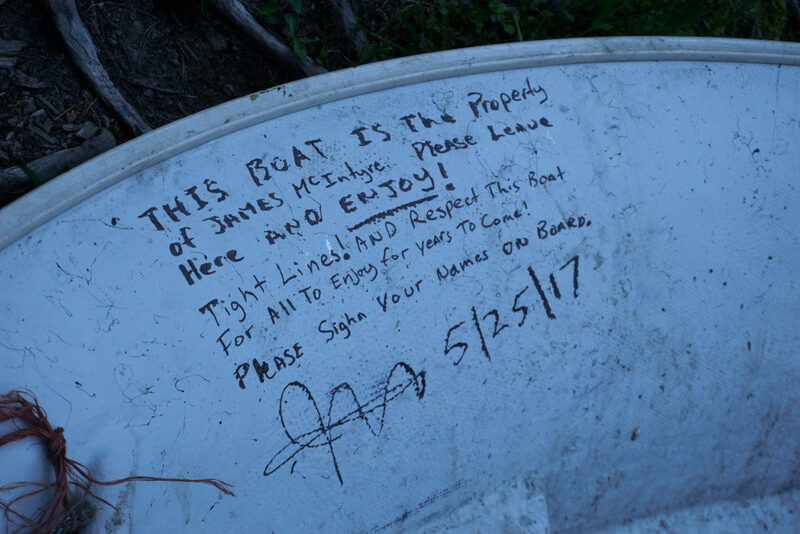 Someone donated a communal canoe at the dock – looked safe to use at the time. 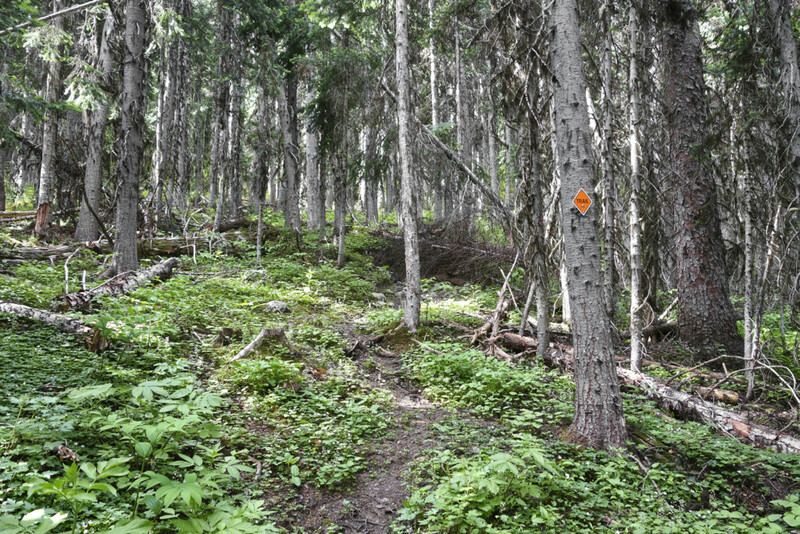 For the first 200m of trail, we paralleled the lake shore and reached another fork. The right branch continued around the lake and petered out quickly in a marshy section about half way around. We followed the left branch (marked with new “Trail” markers) as it climbed steeply through a spruce/balsam forest for ~2km. 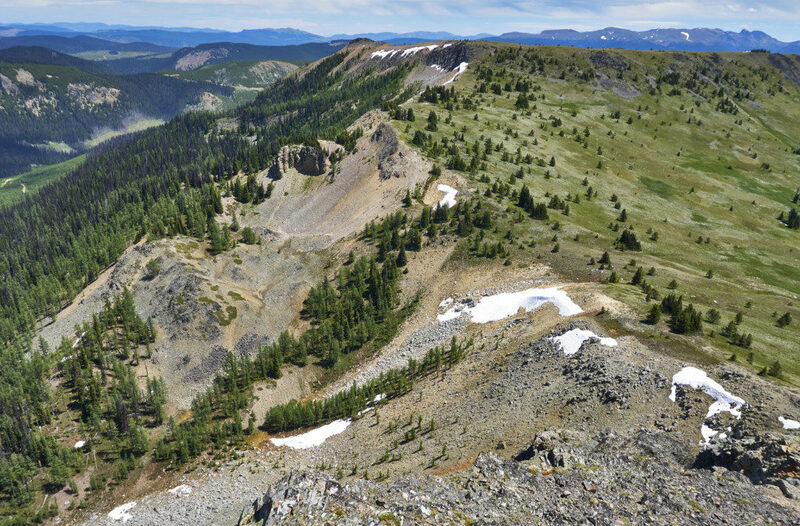 As the grade leveled out, the trees thinned out and we entered the subalpine. From here on, the trail had some gradual hills and we connected to the Border Lake Trail (used for Fat Dog 120). The meadows were full of multi-coloured wildflowers, we stopped every few minutes to take pictures and admire the foliage. The further we got along the trail, the more I realized how much I loved this hike. 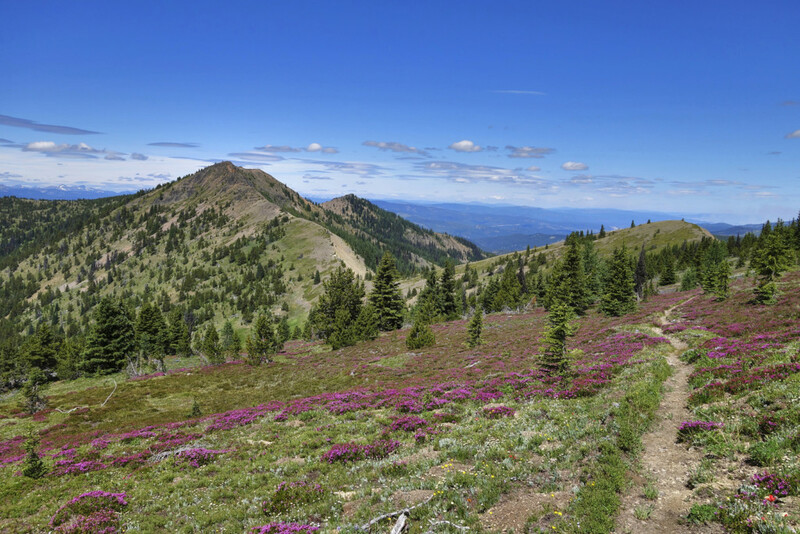 The trail followed a subalpine ridge, but mostly traversed along and around the various high points rather than going up and over. New and different views revealed themselves around every corner. Our route snaked through red heather meadows and blossoming wildflowers, with further ridges and higher alpine peaks in the distance. 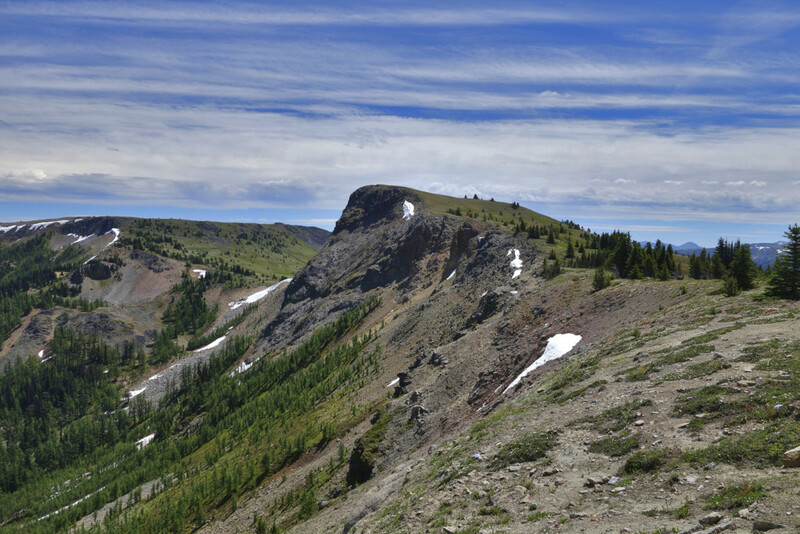 Finally, the trail crested a pass directly west of Flat Top. One of the biggest, broadest alpine meadows revealed itself below us. 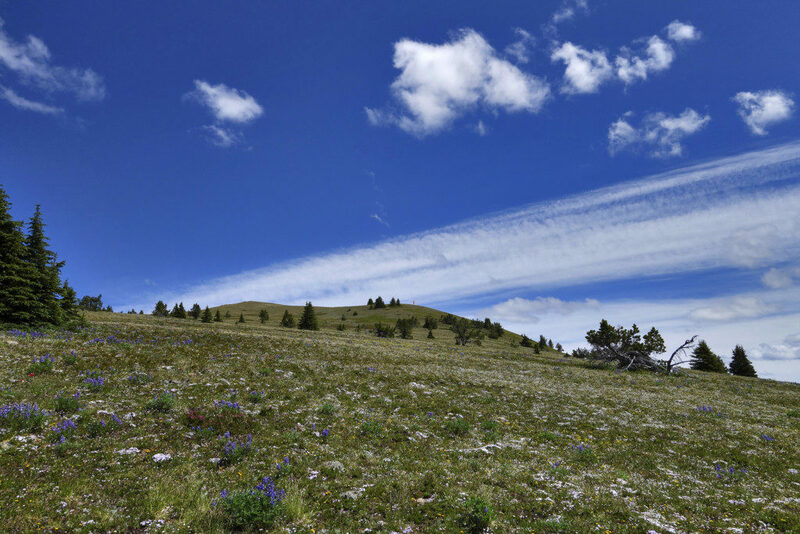 It was a breath-taking site, and we immediately began planning future hikes in the area to visit all of what I could see. 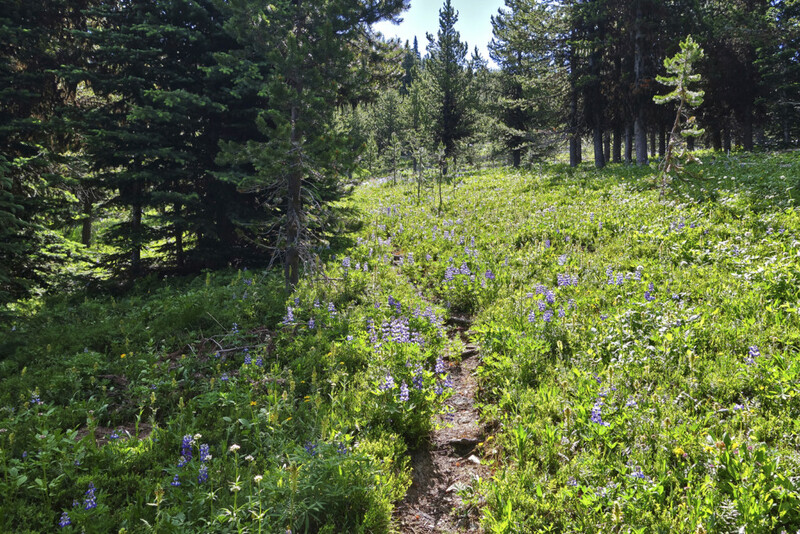 By this point we were already at 2100m elevation, and had a quick walk through the grassy, flowery meadows to reach the “flat” peak of Flat Top Mountain. We had spectacular views, from the meadows extending south before us, to the Princeton wildfire smoke to the north, and all points in between. 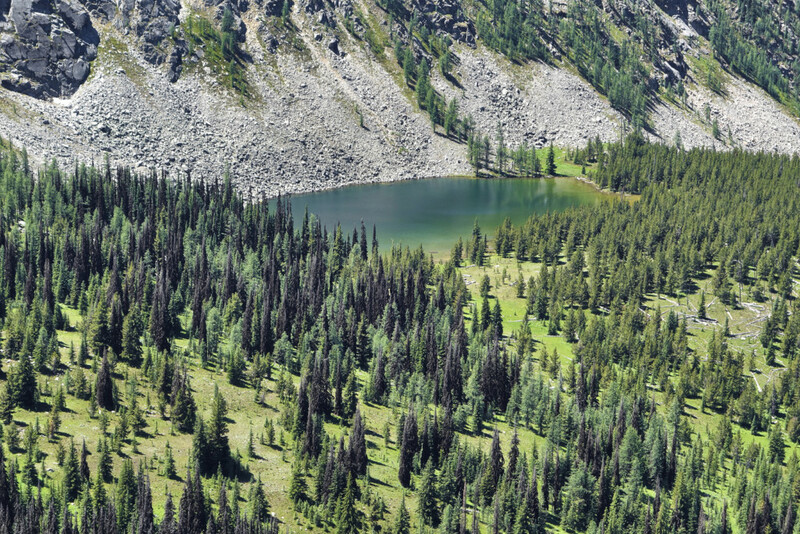 We took an extended picture break and wandered over to the ridge overlooking the unnamed lake to the west of the pass. From above, the lake looked like a cozy spot for camping trip. From the viewpoint, we traced back and joined the Fat Dog trail, and headed back to the lot. if interested you can check my facebook photos of the same hike in October after the fire. Hi Petr, would love to. Do you mind sharing a link? From what I’ve read, it looks like the fire ended up missing the meadows. 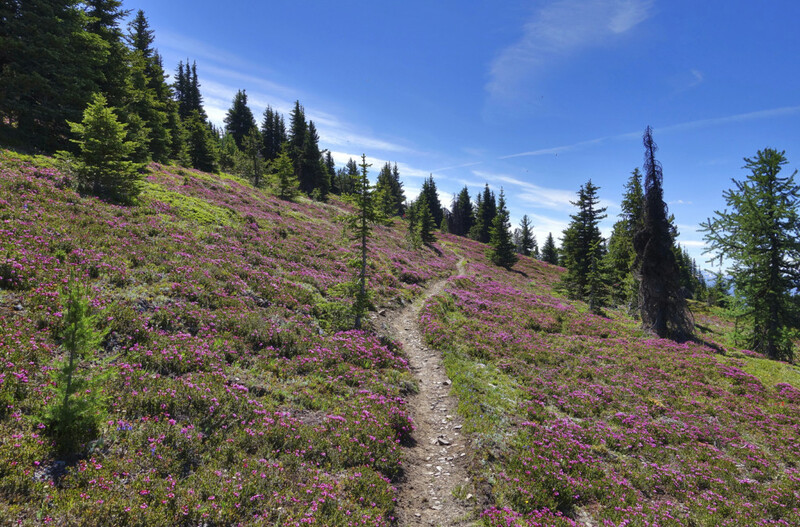 That looks like an amazing hike with the flowers. Nice to see you getting outdoors this summer. Hi Ron, thanks a lot :). We’ve been out and about, just slow on the trip reporting. We’ve been spending a lot of time around Manning and further east. Hope you’re enjoying the summer too.